In February, I had the opportunity to attend one of the four marketing presentations by Mindpower. In attending the first and earliest presentation, I was a little grumpy and a ton skeptical. And I mean a ton. I went to the presentation with the expectation that Mindpower was absolutely not going to win me over. Perhaps it was my 8:00 a.m. grumpiness, but the whole room seemed to align with me. The audience seemed a little tense and apprehensive, almost holding a collective breath. If you remember back, this was the time when Goshen College was beginning to feel out what it meant to have advertisements run during the Superbowl and Grammy’s. With these new avenues of advertising and now a new shift in branding, the audience of students, faculty and staff seemed nervous about the direction of the college. Within fifteen minutes, the initial nervous tension of the room dissolved. To my absolute surprise, I found that I flipped my position. My ton of skepticism shrunk to the size of a pint. 1. Mindpower really listened to Goshen College and captured both our strengths and our flaws. The brand synthesizes these realities into a digestible form and owns it. For example, it doesn’t shy away from the college’s Mennonite affiliation or Other-Than-Mennonites. The new brand holds up and praises both pieces. 2. Mindpower let us know that we should be proud of our identity. Throughout the campaign, Mindpower has given us a way to clearly show our values in an accessible way. 3. Mindpower gave us a reality check that we can’t be everything for everybody. They also assured us that this was alright, even healthy. Since that 8:00 a.m. meeting, I have been in several forums and conversations contemplating the new Mindpower vision. I found that my remaining pint of skepticism found company among other students, faculty and staff. There have been concerns over the biblical tone and accessibility to our non-pacifist neighbors. There has been confusion regarding the branding vision mixing with the Goshen College “core values” or “Culture for Service” motto. There has even been discussion if the college could currently own up and match what the brand claims for us. For example, can we really embody the tag line, “Healing the world, peace by peace?” I believe that we can’t do this 100 percent of the time. But like with the core values or “Culture for Service,” we should always keep trying to aim high to meet our ideals. I see this new brand as far from perfect. But I believe that overall, it is a healthy change and a positive direction for Goshen College. I am looking forward to seeing the final tweaks and official marketing plan in action this April. 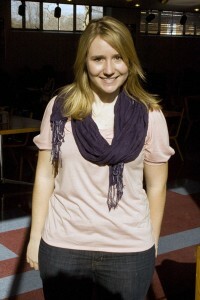 Melissa MacGregor is a senior history and investigative skills major from Glen Ellyn, Ill.